Posted: 0 Post subject: Re: G4 CMC "School Pals" set, GLIMMER WINGS, G1/G3 Ponies &MORE! Updated! CMC School Pals set listed to ebay! Bumping for now... as I cannot edit the main post. Auctions ending in less than 2 days! 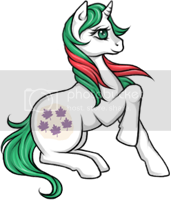 And i WILL be adding some G3 ponies... as well as G1s... as soon as the Arena works it's... "issues" out.... So keep checking back! One more BUMP... as my aujctions are ending in less than 6 hrs! !